This Chocolate Pudding Cake is literally a dream come true for all chocolate lovers of the world! 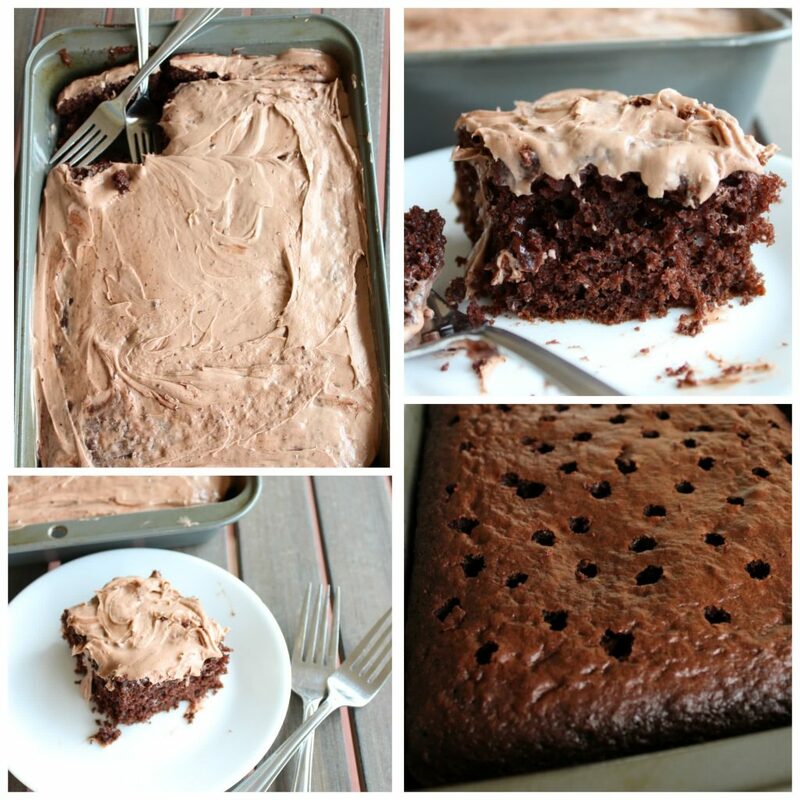 This delicious dessert doesn’t take too long together, and adds just the right amount of fun to a regular chocolate cake mix. Can’t wait for you to try this! Also, don’t count on there being any leftovers….and make sure to get out the napkins! Preheat oven to 350 degrees, spray 9x13 with nonstick cooking spray. Prepare cake as directed on cake mix box, mixing together cake mix, vegetable oil, eggs, and water. After cake is baked, using the handle of a wooden spoon, or a straw poke holes into top of cake. To prepare pudding, follow directions on box, or mix 2 cups of cold milk with instant pudding mix. Pour pudding over cake and into holes. Move around 9x13 and tap on counter to help pudding soak into the holes. For frosting, beat together cream cheese, butter, milk, and vanilla and cocoa. Add in powdered sugar slowly until reaching desired consistency. Frost cake and enjoy! Some pudding and frosting might mix, but that's what makes this chocolate cake so glorious! Chocolate Pudding is used in this cake. 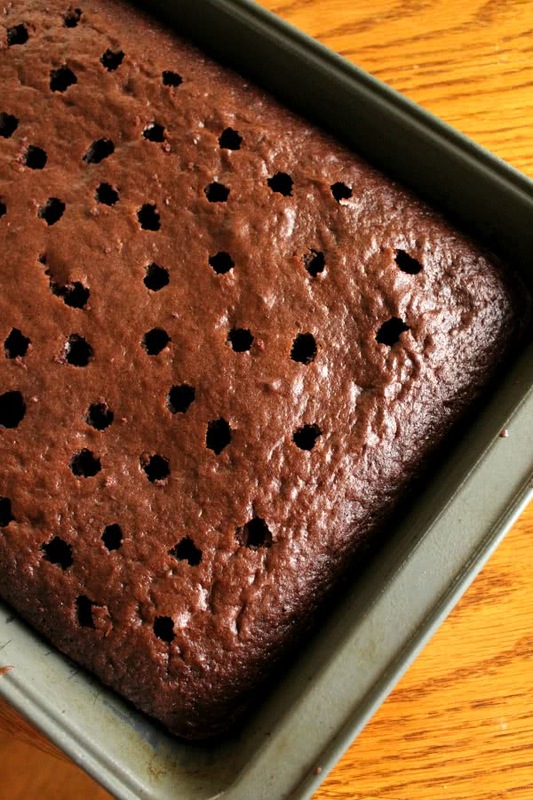 You will love this Chocolate Pudding Poke Cake! 3.9 ounce package of instant chocolate pudding...it's in the recipe!! yeah, what flavor of pudding?? Do you put the pudding on the cake just out of oven or wait until it's cool. Does the pudding work better if it's soft set, or thickened up? Do you put the pudding on the cake just out of the oven, or wait until it has cooled? Also, I'm assuming this cake needs to be refrigerated, correct? Thank you! You will want the cake to be cooled before adding the pudding on top. We added the pudding right after we mixed it, so it was still soft. Hope this helps! !